It's one of the most often asked questions that digital agencies get. Yet, it's hard to tell the exact price because each project is different. Doing it on your own you will probably spend no more than $100 and a lot of your personal time trying to figure things out. Website based on a stock theme is going to cost anywhere from $500-$5,000. For custom website design and development it's going to range anywhere between $2,500-$30,000. A more complex solution like an e-commerce store or a custom application will likely cost you from $5,000 - $250,000 or even more. These are the average prices that you can expect to pay. There is also an option to do it on your own, but be ready that it's likely going to take a lot of your time and nerves. Why Pricing Web Design is so Difficult? Back in the days you’d have to pay your webmaster a few thousand dollars - at least - to build your website. However, these days, that may not necessarily be the case. Today there are multiple ways to do it on your own, with sites such as wix.com and squarespace. Sure they look simple and easy to manoeuvre, albeit should you do it yourself? That’s a whole different question that I will also try to answer in this article. Either way, you’d either have to spend a lot of money or a lot of your time and essentially time is money - is it not? You can expect your website to cost anywhere from $10 to probably even $30,000 or more. Crazy, right? It’s almost impossible to give a flat price since it depends on a lot of different factors. How do they interact with your business? Where do they come to your website from? You’d need to answer all of the questions yourself before even thinking about building a website. Before answering how much does a website cost, let’s figure out why you might need it in the first place. I am not a believer that every business needs a website. A website is usually an intricate part of a large marketing plan designed to bring you clients and generate sales. You can do well without having to build your website. But if you look at all brands online - they do have one. So I think it's worth at least considering building one. When someone first comes across your business, you want to appear credible. You want to have an amazing website and social media presence that show the results that you’re delivering and testimonials that you’re getting. Having it on your website instantly boosts your credibility in the eyes of your clients. Did you know that there are over 3.5 billion searches performed a day on Google? This includes your potential customers looking for your business. If you run a local business like a roofing service, a dentist or a lawyer - you must be online. Just think of it… If you needed someone like a plumber, where would go to find one in your area? Chances are, it would’ve been Google. A website in combination with great SEO can make you a “local hero” in your niche and position your business on the 1st page of Google. And imagine how many customers that would bring your business. Are you doing a good service to your customers? If so, you’re probably collecting their reviews, feedback and doing pictures or videos of your work. And you’d want to showcase that to other potential and existing customers. There is no better place to do it than on your website. Now, you might say that you’re using social media like Facebook, Instagram or YouTube for that purpose. And that’s fine, you need to be using social media as well. However why would you limit your brand’s exposure by just doing social media? Another great thing about having your own website is that you can structure your case studies the way you like. Having a big call to action at the end of each of them, embedding videos, audios, pictures and other forms of media - it's all up to you. And the great thing about it is that you can test different formats of presentation to see which ones like better. You can’t do that with Facebook or Instagram for that matter. When using Google, people are usually searching for a specific solution, product or a service. This is not the case when using social media. Most of the time people just chat with their friends and enjoy themselves by meandering liking and watching celebrities and others. That’s why when people come to your website after they’ve found you on Google, they already have the intent to buy something from you. It makes it much easier for you to convert them into customers. Every month there are more and more people advertising on social media. This space is getting more cluttered and competitive. Cost of acquiring a client is getting higher and the ROI is getting lower due to economies of scale. It gets more expensive to drive traffic to your website from a social media platform each and every day and the truth is it will become worse. On the other hand, when your website is ranked high on Google, you don’t need to pay for all that advertising. You get a lot of organic traffic each month to your website. This is especially the case for local business owners. Even today there is not that much competition on Google. Now, don’t get me wrong, there are some industries that are difficult to rank high on Google, like Marketing or SEO. But for most local businesses competition is relatively low. It is a great chance to start getting leads without paying for ads each and every day. Do you often get clients from referrals? If you do, you know that they are much easier to convert. When you have a good presence online, those referrals can find out more about you before they decide to pick you. And if you have good reviews, testimonials, guarantees that they can easily find online, they’re even more likely to buy from you. This is when a good website comes into play. You can use it to showcase all of that. And it’s much easier for people to refer you to someone. It’s easy to just send someone a url to your website on messenger or via email. It’s much easier than giving them your address or a phone number, which they probably forgot or need to search for. Would you like to have non-stop sales and marketing machine that attracts you new business? Once you have your website is setup correctly, optimized for conversions and with a little bit of SEO work, it will become one. Often times people don’t know how you work and what to expect from your business. This issue can be solved if you describe your work process on the website. People will be more educated and have reasonable expectations. It will lead to setting realistic goals and happier customers. Another advantage is that you will become more reliable in their eyes. If you want more business, you have to be easily accessible to your clients. You can use your website to store all your contact information - address, email, phone number, fax, etc. in one place. This makes it so much easier for others to find and contact you. Most small or medium websites these days come are built on top of a CMS like WordPress, October CMS, Craft CMS or any other. This makes it easy for you to manage content on your website. In a matter of just a few minutes you can add a new page describing a new service that you’re introducing, add new reviews, testimonials, case studies or change your contact information. You don’t need any coding skills to do that and you don’t need to pay your developer either. The answer to this question might be obvious to some and not so apparent to others. Landing Page is usually a one page website. It is used for specific objectives such as marketing or advertising campaign. The purpose of a landing page is to highlight targeted service and capture visitor information to convert them into a future customer. Blog websites used to be very popular 10 years ago. Nowadays, as social media and video content has taken over, blogs have lost their positions. This being said, they still remain a powerful tool to drive traffic to a website. Just take a look at a website like Hubspot or ActiveCampaign. They offer great products and blogging is one of their main marketing channels. Anyway, let’s get back to what a blog is. In most cases, simple blogs have 3-4 pages. They might include a home page, a single post page and an about me page. WordPress is what powers most blogs these days and it allows to setup a blog in a matter of minutes. Portfolio websites are very popular among people that do work in an artistic industry - photographers, web designers, artists and others. Their main purpose is to showcase the work of an individual. Similar to blogs, they are small and might consist of only 1 or 2 pages. What differentiates them is that they have a lot of visual content. Corporate websites are most popular in the realm of business owners. They serve to present a company in a best possible way to the potential customers and make it easy for people to find a company online. Their average size is around 5-10 pages. They often consist of a home, about, contact, services (might also have a 1 service per page) or products, faq and a blog. As e-commerce becomes more and more popular, so do e-commerce websites. Their goal is to list products (also digital ones) and make it easy for a user to purchase using their credit card. They’re often powered by Shopify, Magento or WooCommerce. That’s all great Andriy you might say. But how much does a website cost you might ask. Ok, let’s finally get straight to the point. How Much does a Website Cost To Build in 2019? There are 3 most common options that you will come across to get your website up and running. Each of them has its’ benefits and disadvantages, so let’s cover all of them. If you don’t have a lot of money to invest in your website and you can afford to spend some time, then this options is probably the best one for you. You can surely expect some challenges to arise along the way. This is when Google and YouTube will become your best friends as there are so many tutorials and guides on how to build a website. So let me just give you some pros and cons of this approach. You will save money. The only expenses that you’ll probably have are going to be buying a good theme, a domain name and a hosting service. It shouldn’t cost you more than $100 in most cases. You have a full control. You’ll be able to modify almost anything on your website yourself at any time. This will allow you to test multiple variations of your website and see which one you like the best. You won’t need to write an email to your freelancer or an agency and wait until they do it. You will spend your time. The biggest disadvantage of this approach is that you will need to invest your time and effort into it. If you just want a simple blog, it won’t be that difficult to do. With a more complex request like a corporate website, it will take you more time. And you’ll likely make more mistakes. You’ll need to do a good amount of research and watch a few tutorials before you get things right. Quality. In some instances the quality of work will suffer. This is due to lack of experience or skills. Your website may not look great on mobile or tablet, the loading time might be slow or it will not be optimized for SEO. You will either need to learn more and upgrade your skills or ask someone more experienced to help you. 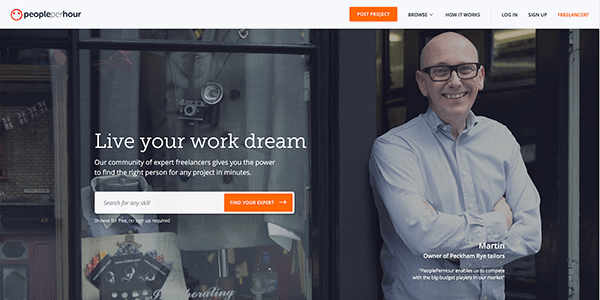 If you don't have time to do it or feel like you don’t have enough skills to build a website on your own, another option for you is to hire a freelancer. This will probably cost you anywhere from $1000-$5000 per project. 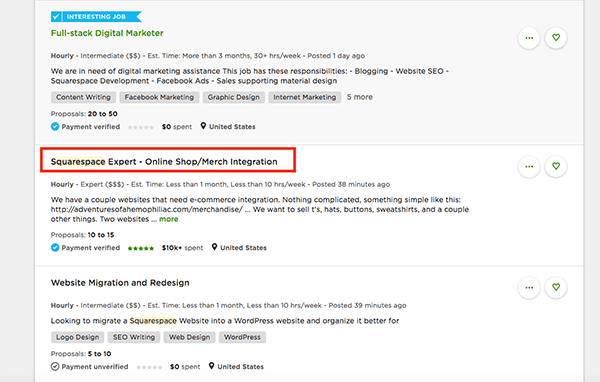 You can use various freelance websites like Upwork, PeoplePerHour or Freelancer.com to find someone suitable. Freelancers usually charge anywhere from $5-10/ hour up to $150/hour or more. When choosing a freelancer, make sure you take a look at their ratings and reviews before hiring him. Also ask them if they’ve done a similar project before. Once you’ve decided to work with a particular person, get them a call and tell them all your requirements and expectations. Ask them about their work process and how long will it take to deliver the job. The more complex the project, the more you’ll have to divide into separate chunks and do it step by step. For a regular website these might include designing your pages, coding them and then configuring a server to make a website go live. You can expect a website like this to be developed in 5-7 days to develop if you have all your content and structure already planned. If you want a custom web design, it might take anywhere from 15 to 30 days to get the job done. Another important thing to remember is to ask them if they provide any further support. You might need it if you need extra features or even if your website gets hacked (things happen ! ). Cost effective. This option is probably the best one if you don’t want to spend a lot of your time. Hiring a professional freelancer will help you get the job done faster and better in exchange of giving up some money. Expertise. You will get to work with someone who specializes in one particular area. This increases the likelihood that your project will be done right the first time. Unavailability. Communication with freelancers can difficult sometimes, especially if they live in a different time zone or continent. It might be a problem if you urgently need them. Work overload. Some freelancer have multiple clients and projects they work on at the same time. This kind of work overload can often times result in a bad performance. You might have to wait a few days to have a small change done. So make sure that you talk about their availability before you decide to choose them. Risk involved. In most cases hiring a professional freelancer is a less risky option than doing project yourself. Yet this doesn’t eliminate all the risk. Make sure that you get someone that is capable of doing your project and don’t look for the cheapest option out there as it will hurt you in the long run. The third option that you have is to hire an agency. And it is the most expensive one. If you are a small business owner looking for a website for your business, it’s probably not the best option for you. On the other hand if you are looking to get a bigger project done and need constant communication with your service provider, I’d highly recommend you consider this option. Let’s look at advantages and disadvantages of hiring an agency to help you decide if it’s a right fit for your project. Low risk. Working with a company is going to be the least risky option. If you pick the right company, there is a good chance that your project will be delivered on time. Communication. Most of the time you’ll pick someone that is in your local area and it will be easy for you to communicate with them. There won’t be any time zone or language barriers. Strategy. Agencies often times take a more strategic approach than just building you a website. Very often you count on them doing marketing and advertising for you as well. Pricing. An average hourly cost of an agency from $100 to $500 dollars/hour. And the overall cost of your project will be somewhere from $5000 for a very simple template based website to $50 000 for something like an e-commerce store or even more. They have a lot of overhead cost that will have to pay for if you want to work with them. Bureaucracy. In most cases you will have to read a lot of documents and sign a contract which will act as a good insurance. Yet, this might be an overkill for small projects. So far we’ve taken a look at all the options in terms of who can build a website for you. Now let’s quickly overview some of the most popular platforms that you can build your website on. If you wanted to build a website back in the days, you’d have to know how to code or hire someone who knows how to do it. There were very few content management systems and a lot of websites were static. Every time you’d want to make a change, you’d have to do it in code. But the times have changed. These days there are 2 main options - using a Web Builder Software or a CMS. Let’s take a look at advantages and disadvantages of each approach. A web builder is essentially an application that simplifies the process of building a basic website. It allows you to drag and drop widgets on a page and build a website. You simply pick a theme and you’re good to go. You can easily change images, text and other content using a powerful WYSIWYG editor. Web builders also allow you to add and remove pages and menus on your website. That being said, there are a few disadvantages of using them. The first one is that you’re limited to the theme that you’ve purchased. If you want to add some custom block of content, you would probably get stuck. One option you have is buy another theme, but chances are that it won’t fit your needs 100%. I’ve seen many people get frustrated and waste a lot of time basically “fighting” with a web builder to get things done the way they want them to be done. If you need help with this approach, there are freelancers that can do Wix or Squarespace job for you. You can find them on services like Upwork. Wix is probably the most popular web builder out there. As with most builders, you just choose a template and you can start creating your website. The most basic version is free. It does come with a Wix ad at the top of your webpage. The basic free option doesn’t allow you to link your website to your own custom domain either. Here is the pricing that they offer at this moment. 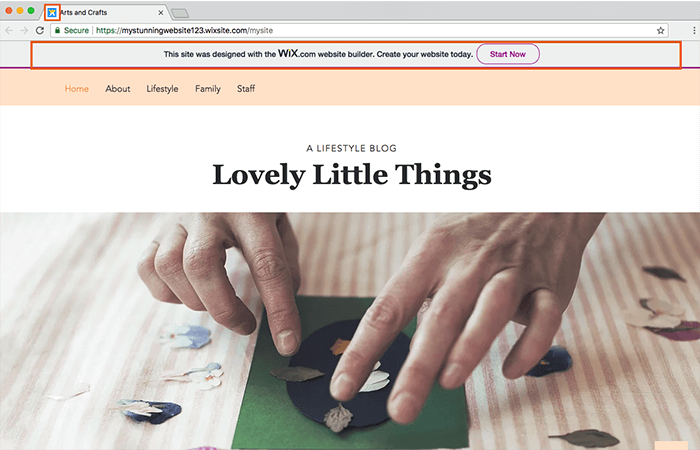 Take a look at this tutorial that shows you how you can build a website on WIX. Squarespace is very similar to WIX and has similar disadvantages. You can get a very basic website running quickly. Here is a good tutorial by Tyler Moore showing you how to do it. Its’ pricing is similar to WIX, however it has 2 different options for simple websites and online stores. Both Wix and Squarespace allow you to install extra plugins to extend the functionality of your site. A lot of them are not free. And the downside is that you can’t customize the code of the plugin. So in case something doesn’t work as expected, you need to contact customer support or the company that has built that plugin. This issue is usually not the case with CMS solutions. Just like web builders, there are multiple CMS platforms out there. Most of them come with a visual installer where you’d have to put in your domain name, your database credentials and you desired username and password for the admin user. After you’ve installed it, you can pick a theme and use it for your website. They are usually a lot more flexible and allow to extend the functionality of your website. 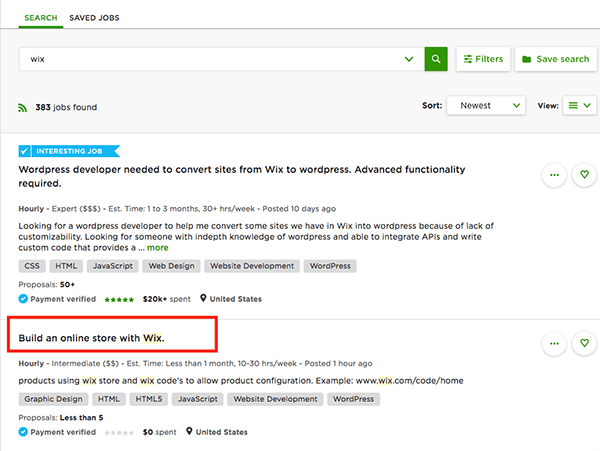 You can use plugins to extend the functionality of your website. The downside is that you need coding skills to make a plugin or sometimes even adjust a plugin that you’ve bought. This means you’d probably need to hire a developer to do the work. With that said, let’s take a look at some of the most popular CMS solutions out there. WordPress is by far the most popular CMS out there. It powers around 32% of all websites over the web. Most small to medium websites are built on top of WordPress. Due to its’ popularity, you can find a look of great looking and mobile friendly themes out there. Some of them are free, the others usually cost anywhere from $20 to $100. Buying and installing one of them can be a good starting point for your business website. The good news is that it’s not difficult to do even if you don’t have any coding skills. Plugins are another building block of a WordPress website. They help you add additional functionality that you might need. For example, you can easily add forms to your pages using the Gravity Forms plugin. Just like themes, they all vary in pricing. And similarly, you can install them right from your admin dashboard. But where’s the catch you might be wondering? You see, all these things look great and in most cases they work. But sometimes you can stumble upon all kinds of problems. For example, if you buy a cheap theme, it may not be compatible with other plugins. Another case that is popular is that you install too many plugins and they start to interfere each other. Or they might not work well with your theme and you might need to fix the styling. All those are common problems. And they are almost impossible to solve without digging into the code. That’s why it might be a good option for you to invest in hiring a pro. Another great thing about WordPress is that it offers blogging capabilities out of the box. When it comes to SEO, WordPress offers quite basic options. But there are many great free plugins that can help you rank #1 on Google like Yoast SEO. Yoast is highly recommended by a world’s top marketer Neil Patel. While WordPress has been released in May of 2003, Drupal has been around even longer - since January of 2000. Even though WordPress holds the vast majority of the CMS market share, Drupal can still be a great option for your website. It’s community is a lot smaller and you don’t have that many plugins and themes to choose from. This is an advantage when it comes down to security. Many free WordPress plugins have security issues that ones can use to hack your website. The more plugins that are available, the more likely it is that you can install a dangerous plugin. Hence, the less plugins - the better. To back this up, take a look at the websites that are using Drupal. Many of them are big institution like Colorado General Assembly or Government of Bermuda. Comparing to WordPress, Drupal has a steeper learning curve and is more difficult to install and maintain for a regular person. That’s why you’re likely to run into situations where you’d need help from a developer. And obviously this will result in higher expenses. October CMS is relatively young compared to the previous 2 platforms. Its’ initial release happened in May of 2014 but it’s becoming more popular. To be honest, the reason I’ve included it here, is because it’s our go-to platform for most projects. The big reason for that is the fact that it’s built on top of Laravel which a very robust and developer friendly framework among developers. Similarly to WordPress, October has 2 main building blocks - themes and plugins. There are lot of great plugins that will help you extend your website’s functionality. When it comes down to themes, there aren’t that many out there yet. Since with most of the projects that we do at PROGMATIQ we develop custom website design, lack of themes is not a big obstacle. October is similar to Drupal. It’s a bit less friendly to a regular user. But once it’s setup and configured properly, you can easily use it to manage your website. Just like all the other CMS platforms, it has a nice user friendly WYSIWYG editor that will allow you edit your content. With addition of just a few popular plugins (Static Pages, Blog), you can easily manage all the menus, pages on your website and write articles for your blog. The other HUGE advantage of October is that it’s a lot more developer friendly and uses the latest versions of PHP to run on. This makes it a lot easier and in so much faster for a programmer to develop a custom plugin for your needs. October is also a more robust system if develop on if you’re planning on going beyond just a regular 4-8 pages website. Many agencies all over the world are switching to October as their go-to system. It has also been voted the best flat file CMS of 2018 by a popular CMS Critic website. After your website is up and running, you’ll have to maintain it. Even though they’re not as high as the setup costs, you still need to keep them in mind. Domain/Hosting. No matter which option you choose, whether it’s a website builder or CMS, you’ll have to pay domain and hosting services. Hosting is usually paid monthly, while domain you’ll have to renew every year. Don’t forget to do it, as someone might be waiting for your domain to expire and buy right after it’s expired. Also make sure to take a look at domain renewal rates that your provider offers. It is a common theme where you can get your domain very cheap, but renewing it will cost a whole lot more. These are not huge prices in most cases, but you need to be prepared for them. Updates. It’s not uncommon that you’ll have to update the CMS platform that you’re using. Updates usually fix bugs, security issues and add new functionality. That being said, they might sometimes be tricky to do if your website uses many plugins or you have some custom functionality in place. So be prepared for that. 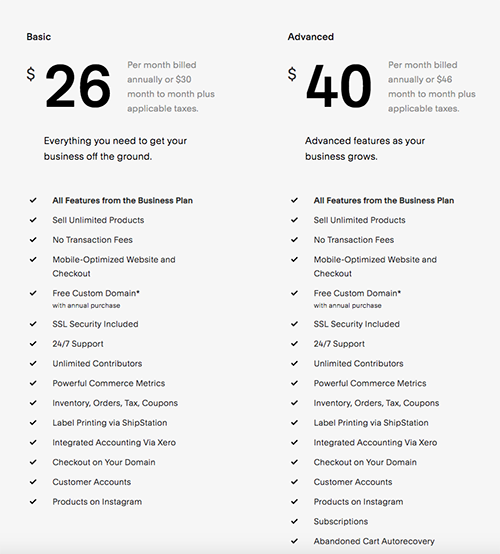 If you’re using an agency/freelancer to build and setup your website, make sure you ask them about their pricing and process that they use for updates. Some even might use a recurring model where you pay them a fee to maintain your website. In either case you need to ask about that upfront before you agree on a project. Images. If you have a blog on your website or even simply like to change images to keep it fresh, chances are that you’d need to find them on the internet. There are a lot of photobanks that you can get pictures from. Some of them are free, some are not. The most popular free ones are Unsplash and Pexels. You can also use iStockPhoto or Adobe’s Stock as well as many others to purchase from. Another great tool that is a bit different than photobanks is called Canva. You can great great posters, cover photos, infographics and much more using this tool. It’s a subscription type service and it comes with a lot of images that you can use and don’t need to pay for extra. SSL certificates. Your website should be using the https in order to be secure. If you don’t have a https website, it will be much more difficult to rank it in Google as well. In order to have the https, you need to have what’s called an SSL certificate. They often need to be renewed annually and just with domain names - prices vary a lot. Just keep that in mind when you’re preparing and calculating your website costs. Copywriting. If you want your website to sell, you need to have a good copy. This is definitely something worth investing into. Just like web design costs, copyright costs also vary a lot. But let me give you the range. For a corporate website that consists of 5-8 pages you can expect to pay around $1000 - $3000. If you are doing a website for your company and/or have a blog, your copy also has to be optimized for SEO. So pay attention to that when you are choosing your service provider. If you are interested in other forms of writing for your website (blogging, sales pages, etc.) - here is a good guide you can read. If you’re using a CMS system like WordPress or October CMS, then you’d need to host your website on your own. This means that you’d need to purchase a hosting. You can use Bluehost, Hostgator or WP Engine for this purpose. Most of them will cost you anywhere from $3-$20/month. The downside is that every time your website grows and brings in more traffic, you’d have to upgrade to a more expensive option. You’ll also need to buy a custom domain. A domain name is the name of your website on the web, like www.mycompany.com. Most hosting providers allow you to purchase your domain together with buying their hosting service. In most cases I would highly recommend buying hosting and domain from one vendor. If you have your domain purchased from another company, you’d need transfer it. This might be a bit tricky if you’ve never done this before. 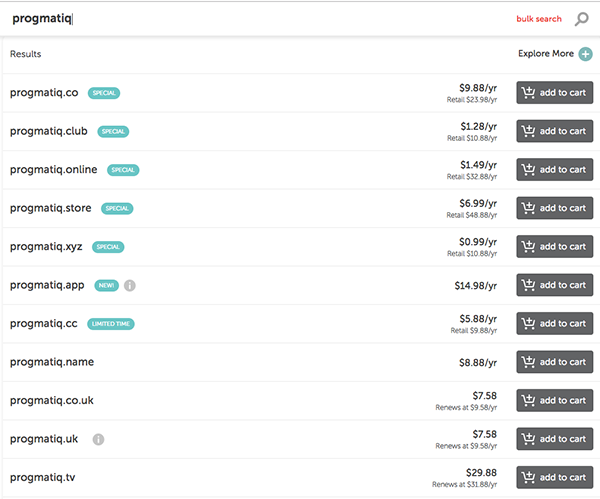 Domain prices can vary a lot. Starting from $5/year to even $2-3k. But in most cases, you shouldn’t spend more than $15-$20 per year. If you decide to go with a website builder like Squarespace or Wix, they will assign you a subdomain by default. 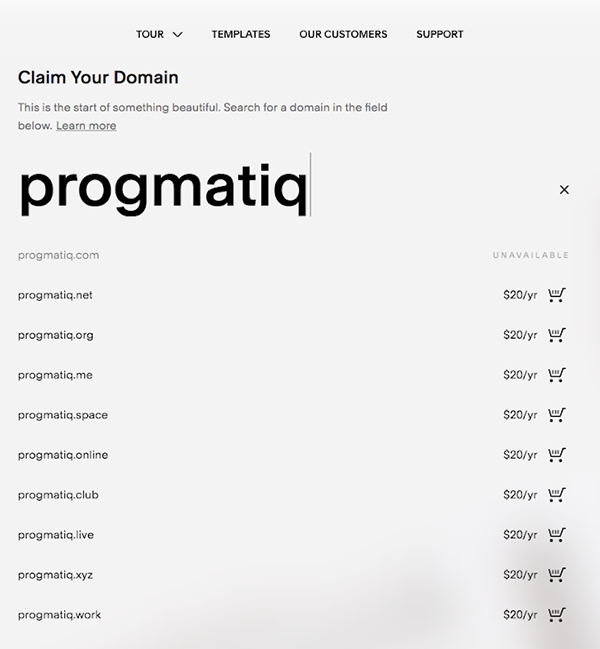 It might look something like this: yoursiteid.squarespace.com, where yoursiteid will be replaced with the identifier of your website in the squarespace system. This usually is some kind of random combination of letters and numbers. 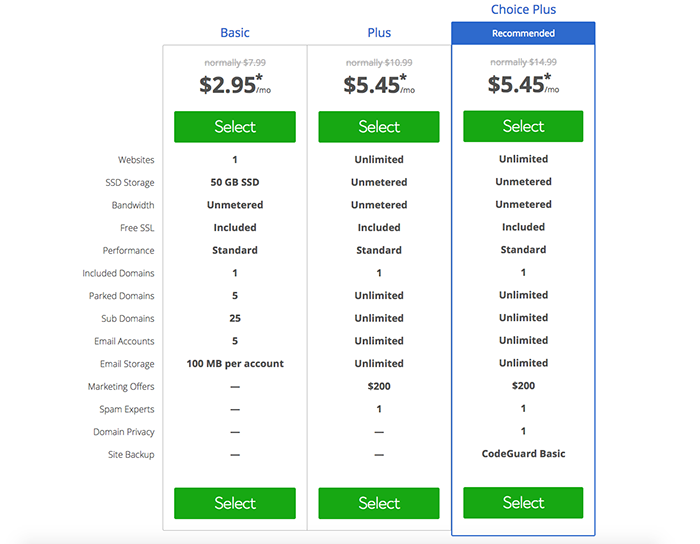 These systems also allow you to use your custom domain name, but you’ll have to pay extra for it. It’s likely that in this case you’d have to pay more for a domain name. Once you have a website built, you need to drive traffic to it. So you have to take into consideration. There are many ways you can drive traffic to your website: SEO, social media marketing, PPC, video platforms and others. First of all you need to decide who your audience is, their demographics and where do they hangout. After that, you can figure out what platform(s) you’ll be using to get leads to your website. You can also hire a digital agency to do the marketing for you. And those expenses will be high. Let’s assume that you will be doing marketing for your business on your own. Content marketing. “Content marketing” is king as they say. It is one of the best ways you attract people to your business. Depending on the platform that you will be using, you might be writing blogs, doing a podcast or shooting videos. If you choose the first option you might need someone who will be doing it for you. If you’re going to be using podcasting or video you’d most likely need to buy the appropriate equipment to do that. Social media marketing. Paid advertising is another way you can get people to your website. If you’re in a B2C business, your best options are probably Instagram, Facebook and Pinterest. For B2B businesses, LinkedIn and Twitter are your best options. YouTube is good for both B2B and B2C. All these platforms allow you to promote yourself using paid advertising. You would likely also also need to use tools like Buffer which costs to schedule your posts and Canva to create great images for your content. 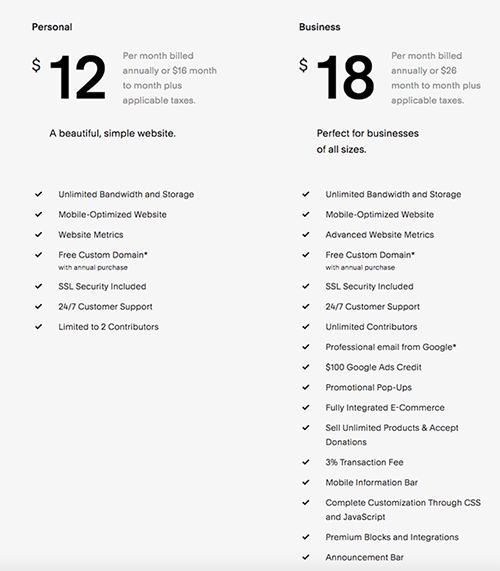 Buffer costs anywhere from $0 to $399 per month and more if you have a big team. Canva costs $12.95. SEO. SEO is a great high conversion strategy, especially for most local businesses. If you’re going to do it on your own, you will need a few tools to do it. Some of free ones are Ubersuggest for keyword research and Google Search Console. If at any time you something more advanced, ahrefs is an amazing tool, but it is quite expensive. Price starts at $99/month for a single user and quickly goes up to $999 for a team of 5 people. 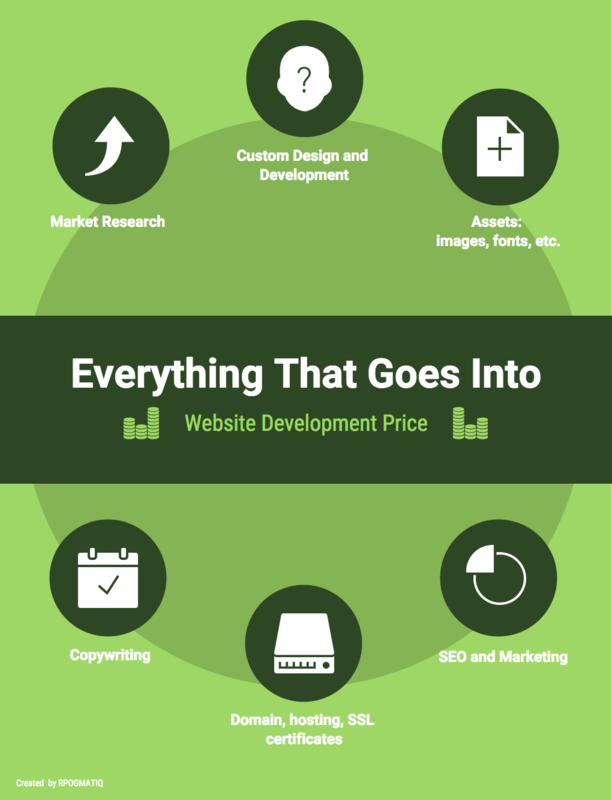 Web Design Prices: What Are the Averages? Most agencies determine their price using this simple formula - hours required x hourly rate. So if your project will take 100 hours to build and their rate is $75/hour, then you can will pay them $7500 for your project. The time required to build your website obviously depends on project complexity. Simple blogs or corporate websites are usually easier to build than an e-commerce store. One thing to mention is that if you’re going to do it on your own, be prepared that you’re likely going to spend a lot of time figuring things out on the way. You’ll probably make many mistakes as well. But it’s ok, it’s a learning curve. On the other hand, if you want to get it done right the first time and you can afford to spend a few thousand dollars, you should do it. You’ll save yourself a lot of time and nerves this way. As you can see, it is very difficult if not impossible to give a flat price for a website. It depends on what kind of website you need, who’s going to do it for you, what is your overall marketing strategy and lots of other factors. I hope that this article was helpful to you. If so, feel free to share it with someone that might also need it. Need help building your website? QUIZ: Do you know how to run your business online?